A good running stride means you are using your body's energy efficiently and helping keep yourself injury-free. It could also mean an overall faster pace, which is excellent news for all runners. To find the perfect stride length, you have to examine your form and practice good running techniques. Whether you're a barefoot runner or a fan of the maximalist trend, finding your perfect stride length will keep you running strong. A stride length is the distance from the toe of one foot to the toe of your other foot as you run. Stride length varies from person to person, but an ideal running stride should be relatively short in length. 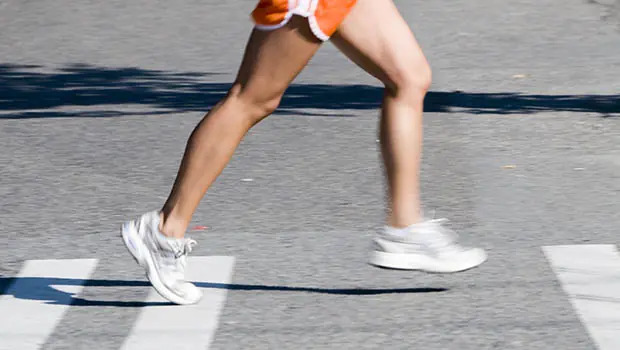 Many runners make the mistake of overstriding, meaning they extend their foot too far in front of their body, thinking this will increase their speed. However, overstriding could lead to heavy wear on your muscles, sore knees and other injuries. A stride that is too long can also be difficult to maintain over extended mileage; the body has to work harder to stride further, leading to an inefficient output of energy and increased fatigue. To maintain proper stride length, aim to keep your foot strike under your body. When you want to accelerate, avoid the urge to lengthen your stride, and instead quicken your turnover steps. This is where stride rate comes into play. An average runner will have a cadence of about 150 to 170 steps per minute. An elite runner counts about 180 steps per minute. To find your cadence, run for 30 seconds and count the times your left foot hits the ground; then, double that number to find the number of foot strikes for a minute's worth of running. Double it again to find the total for both feet, or your average stride rate. More: QUIZ: What's Your Running Lingo IQ? Some experts will suggest running barefoot to test your stride. In a barefoot run, you'll see that you have shortened your stride because of the foot's natural desire to avoid too much heel strike. To find your exact stride length, check out Tech4O's stride calculator. Enter a certain distance and your steps over that distance (you will need to have already calculated this), and the calculator will give you your average stride length. "Every runner has a different perfect stride," says Stephen Suydam, director of research at Milestone Sports, creators of the MilestonePod, a device runners can attach to their shoes to measure stride length, cadence and mileage. "Finding your perfect stride length is a matter of finding the stride that reduces your braking force," Suydam says. "If you land with your foot in front of your body, you end up slowing yourself down until your body weight is over the top of your foot. Reducing your stride length so your foot lands under you reduces that braking force." Do You Have a Good Stride? Suydam suggests recording a video of you running on a treadmill from the side. Freeze the frame when your front foot hits the ground. Draw a line from your belly button straight down. Draw another line from that front foot straight up. The two lines should be close to each other. As you run, let your foot strike just below your body and not in front. Lean your body forward slightly as you run, but don't bend too far. Run tall, with your head upright as if you were running with a book balanced on your head. Watch for any side-to-side arm movement. Your arms should move forward and back. Stay relaxed. Avoid tensing your shoulders while you run. Practice. Training your body to run with proper form may take practice. Amanda Casanova is a writer and journalist living in the Dallas, Texas area. She has worked for the Houston Chronicle, the Abilene Reporter-News and the Galveston County Daily News. She is an active runner and regularly competes in races in north Texas. She is currently training for her first half marathon. She blogs at http://tx.ag/casanova and tweets at @acasanova10.